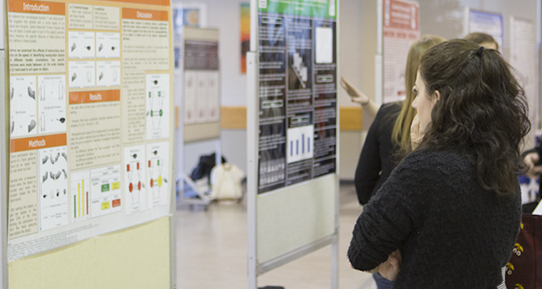 At the annual Psychology Students of Vancouver Island Poster Session a group of undergraduate Psychology majors present their research to the community. For the Department of Psychology's grading expectations see the UVic Academic Calendar. Learning goals of the Department of Psychology are outlined in the Departmental learning goals statement (pdf). Learn about Important course policy information (pdf). The Department of Psychology has determined that to facilitate learning, certain courses require pre-requisites to ensure that the necessary prior knowledge has been mastered. On occasion, these pre-requisites may prevent a student from registering for a class. The most likely instance of this is when a student has taken a similar course to the pre-requisite at another University or Department, but it has not been fully transferred or recognized. Students may formally request a Course Pre-Requisite Override by completing the Course Pre-Requisite Waiver Form. Pre-requisite override requests for missing classes (as opposed to transfer or similar issues) are handled on a case-by-case basis, and students must still complete the form. In these instances, registration priority will be given to students who have met all course pre-requisites. Forms are typically processed within 2 - 3 working days.